The group gathers for the tour and meets David Goldstein, Founder of Boston Chocolate Tours, and tour guides. We spent part of our weekend walking about the city as part of The Back Bay Chocolate Tour organized by Boston Chocolate Tours. While we won't give away all of the surprises, we will give you some highlights on what to expect. The tour begins at Tealuxe on Newbury Street and begins with a cup of hot cocoa which was nice to have in this weather. The groups are limited to no more than 15. You do get samples and experiences at every stop along the way and a bottle of water to clear your palate. Everyone is provided with sample bags in case you reach chocolate overload and want to take your treats home to savor later. Great idea! 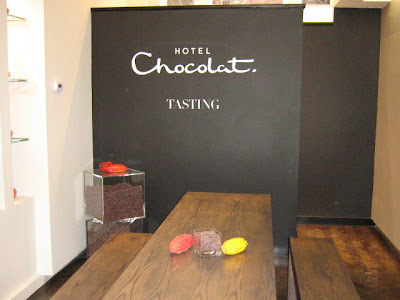 We were ushered into the tasting room at Hotel Chocolat, the only one of its kind in the City. 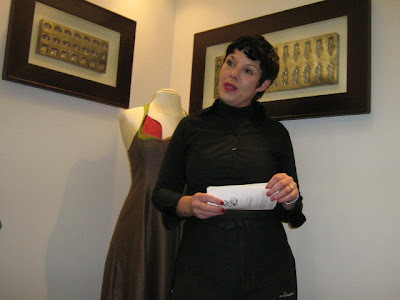 Our first stop was Hotel Chocolat, the most informative visit along the route. Here we learned about chocolate production, had a formal tasting and learned about their many exotic flavors. The very informative tasting at Hotel Chocolat. We begin our chocolate tasting experience at Hotel Chocolat. It wasn't just food. 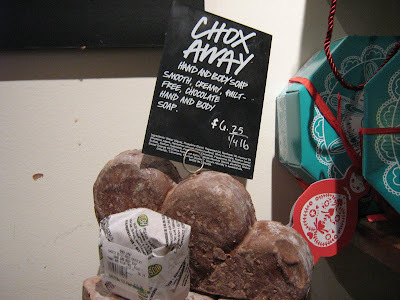 We experienced lots of other cocoa based products including this chocolate soap. Teuscher Chocolatier on Newbury Street, Boston. 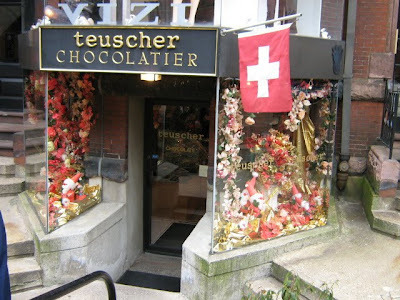 Teuscher Chocolates was founded in a village on the Swiss mountainside over 70 years ago. 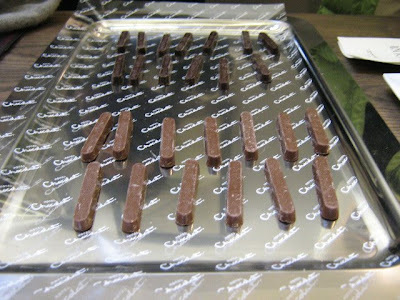 They have resisted the urge to expand to large scale manufacturing and still produce their signature product, the Champagne Truffle, employing the original method. Fresh shipments are then flown into this Boston location weekly. For TBF, this was the premium taste we experienced on the tour. The creamy Dom Perignon Champagne core is an incredible taste experience. 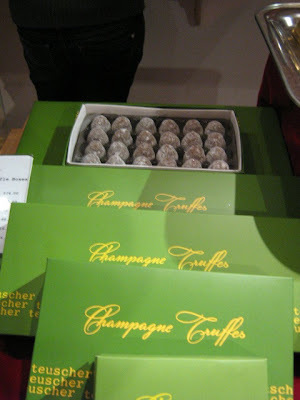 The jewel in the crown: Champagne Truffles by Teuscher. Bacon and chocolate! Just one of the many samples at Gourmet Boutique. 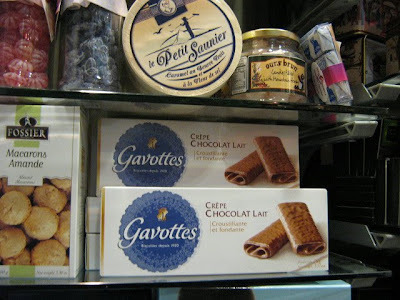 Gourmet Boutique in Copley, a real hidden gem for gourmet shopping. 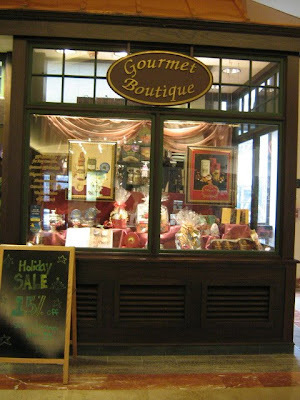 We also visited Gourmet Boutique, tucked in a little corner inside the Westin-Copley Shopping Mall. 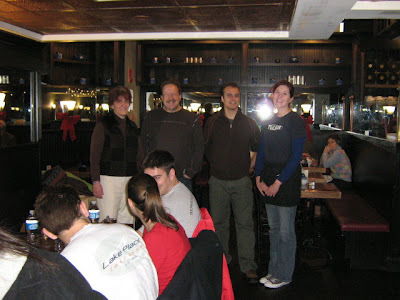 This was new to virtually everyone on the tour but has been providing gourmet delights to sophisticated Bostonians for years now. They are also the premier source for caviar in Boston. Drop in and visit Anya Zelfond, whose official title is Gourmet Princess, for those hard-to-find euro candies and treats you've found on faraway travels but can't locate a source for here at home. If they don't have it they will find it for you. 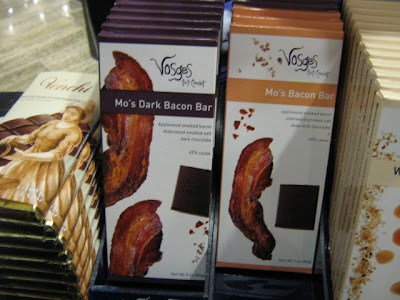 Their chocolate bacon bar was the biggest seller on the tour. Some of the many hard-to-find items at Gourmet Boutique. We leave you with this little video of the tour experience provided to us by Eric Leist, a friend and fan of TBF.